We had one of my colleagues to dinner recently and we proudly showed off our Sportsmen Classic. 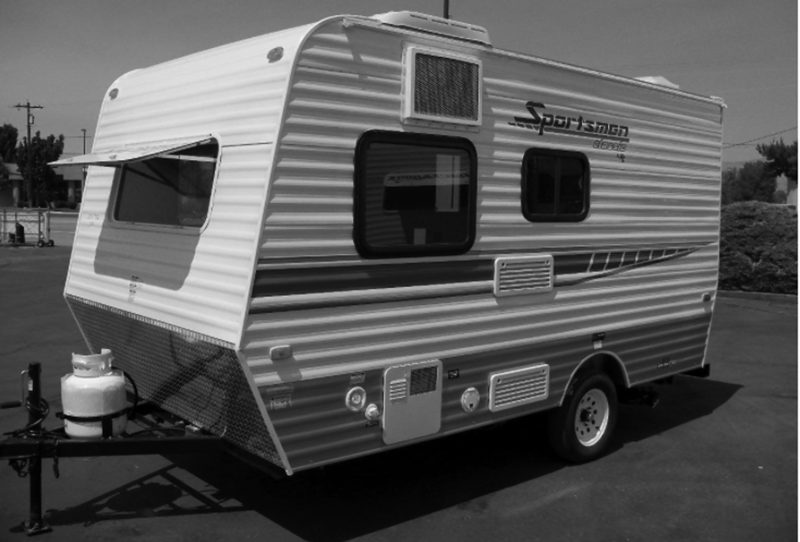 We carefully explained that it wasn’t a “camper” but a “travel trailer.” We have no intention of camping. Rather, our trailer accommodates our travels. We don’t lack certain creature comforts in our little house on wheels. We have Ralph Lauren bedding, for goodness sake! We have a high-def flat-panel TV! We have air-conditioning! We have indoor plumbing, complete with a flush toilet and a shower! We have a Breville toaster oven! How can anyone call that “camping”? My colleague asked about our travels to date and we told her about a recent weekend we spent at an area lake. She asked, what did we do? We talked about how we cooked wonderful meals and took long walks and gazed at the stars. She said it didn’t sound much different than what we do on any other weekend when we’re at home, to which I responded, “We don’t do what we typically do.” We don’t do chores. We don’t do yard work. We don’t do laundry. We don’t run errands. We don’t fret over finances. And we don’t fall asleep, exhausted, in front of the TV. We don’t do what we typically do. Despite its small size (or perhaps because of it), our little house represents a big idea to us: Minimalism. We are so often overwhelmed by the complexity of modern life. The idea of getting away from it all, in a little, self-contained house, is so alluring that it almost seems novel. Yet people have longed for just such minimal existence for centuries. In the first century before the common era (BCE), the Greek architect Vetruvius asserted that every structure must be solid, useful and beautiful. According to Vitruvius, architecture should be an imitation of nature. A bird nest and a beehive, although simple structures, are solid, useful and beautiful, particularly to the birds and the bees. Thus, even a shelter in the forest can be virtuous. A mobile living structure, such as our Sportsmen Classic, shouldn’t be an emergency accommodation or a temporary shelter, but a voluntary place of retreat. It should minimize our ecological footprint and reduce our living environment to only the most essential elements. Our little “weekend house” is equipped with everything we need for living. Like a “studiolo,” or studio apartment, it is completely self-contained. The back part serves as a living room/kitchen: On one side, there is a sofa; on the other, a kitchen, complete with microwave, stovetop and refrigerator (again, only that which is necessary). A generous table under a wide window converts to a bed. A two-piece bathroom (admittedly, a bit cramped) is a little luxury, especially on the road. To protect the our “home away from home” from all sorts of weather, the exterior is covered with aluminum paneling. The overall shape resembles classic travel trailers of old, but our Casetta’s angled corners and overall façade give the impression of a distinctly contemporary product. In short, our little house is no simple camper but a technically perfect and aesthetically attractive refuge. Is it any wonder we can’t wait until the next travel adventure?